The Country Music Hall of Fame® and Museum will tell the story of the stars, sidemen and songwriters who created and popularized a new kind of country music in mid-20th century America in The Bakersfield Sound: Buck Owens, Merle Haggard, and California Country, a more than 5,000-square-foot exhibition on view March 23, 2012 through December 31, 2013 © 2012 Karen Rubin/news-photos-features.com. The Country Music Hall of Fame® and Museum will tell the story of the stars, sidemen and songwriters who created and popularized a new kind of country music in mid-20th century America in The Bakersfield Sound: Buck Owens, Merle Haggard, and California Country, a more than 5,000-square-foot exhibition opening on Friday, March 23, 2012, and closing on December 31, 2013. Narrated by Dwight Yoakam, the exhibit will explore the roots, heyday and impact of the Bakersfield Sound, the loud, stripped-down and radio-ready music most closely identified with the careers of Country Music Hall of Fame members Buck Owens and Merle Haggard. Co-curated by the institution’s Curatorial Director Mick Buck, Photo Collection Manager Tim Davis and Museum Editor Michael Gray, the Bakersfield Sound exhibit includes more than 100 artifacts and a generous overlay of audiovisual treasure. “We are incredibly excited to explore the Bakersfield Sound story,” said Museum Director Kyle Young. “It’s an epic tale, born in the Great Depression, set two thousand miles from country music’s epicenter, and populated by a remarkably talented and tight-knit community of musicians who came together to invigorate and reinvent country music as they knew it. These colorful artists infused their work with an aural intensity and independent spirit, in the process creating a sound that reverberates through country music to this day. Grand opening weekend will be highlighted by a Saturday, March 24 panel discussion featuring Dallas Frazier, Don Maddox, Rose Lee Maphis, Buddy Mize, Country Music Hall of Fame member Jean Shepard and Red Simpson. Later that afternoon, all of the panelists will participate in a concert, headlined by Simpson, backed by West Coast bandleader and guitarist Deke Dickerson and other noted musicians from Tennessee and California. Other opening weekend programs include a Bakersfield Sound book talk, a film screening and an instrument demonstration (see complete details below). The exhibit will also be accompanied by a richly detailed, lavishly illustrated, 96-page companion book, titled The Bakersfield Sound: Buck Owens, Merle Haggard, and California Country. Published by the Museum’s Country Music Foundation Press and exclusively distributed by the Hal Leonard Corporation, the volume will include essays by California-based music journalists/historians Scott B. Bomar, Randy Poe and Robert Price. Also included are dozens of archival photographs and beautiful color images of many of the artifacts included in the exhibit. The book will be available in the Museum Store and at www.countrymusichalloffame.org. Bakersfield Sound is supported by the Academy of Country Music, Ford Motor Company Fund and SunTrust. Additional support was provided by Buck Owens Production Company. Promotional support is being provided by media partners Great American Country Television Network and Cumulus Media. The Bakersfield Sound story begins during the Great Depression, when Bakersfield’s cotton farms and oil fields attracted a mass migration of Dust Bowl refugees from Oklahoma, Texas and Arkansas. Born in Texas in 1929, Buck Owens moved with his sharecropping parents to Arizona before heading to Bakersfield in 1951. Merle Haggard’s family, driven to the area from their east-Oklahoma farm, lived in an old converted railroad boxcar when Haggard was born, in a Bakersfield hospital, on April 6, 1937. The exhibit will explore Bakersfield’s club scene where, in the 1940s and 1950s, the city’s plethora of dance halls and honky-tonks provided respite for wall-to-wall, rambunctious workers eager for the boogiefied honky-tonk of the Maddox Brothers & Rose or the eclectic swing sound of Bob Wills. Also on the bandstands were enormously influential musicians Wynn Stewart and Tommy Collins, whose classic honky-tonk songs Owens and Haggard would later record, and for whom they worked as sidemen before launching solo careers. The exhibit also spotlights Bill Woods, widely regarded as “The Father of the Bakersfield Sound,” and other musical architects, including “Cousin” Herb Henson, Ferlin Husky, Billy Mize, Fuzzy Owen, Bonnie Owens, Jelly Sanders, Jean Shepard, Red Simpson and Lewis Talley. One of Bakersfield Sound’s recurring themes is the connections between all of the artists making music during this fertile period. This is epitomized by the careers of Bakersfield’s greatest stars, Owens and Haggard. As they came to prominence in the 1960s, their careers and personal lives were interwined not only with each other but with virtually all of the other major figures of the Bakersfield scene. These two superstars remained faithful to the classic honky-tonk style and, at the same time, gave country music a harder edge in keeping with the drinking, loud talking, fist-fighting and romancing that characterized Bakersfield’s nightclub culture. Owens and his top-notch band, the Buckaroos, first popularized Bakersfield’s amped-up hybrid of honky-tonk, rockabilly and western swing with 1960s chart-toppers like “Act Naturally,” “Love’s Gonna Live Here,” “Together Again” and “I’ve Got a Tiger by the Tail” and Haggard and his equally stellar band, the Strangers, soon followed with the unforgettable gems “Sing Me Back Home,” “Mama Tried,” “Okie from Muskogee” and “The Fightin’ Side of Me.” These Bohemian originals scored nearly 60 #l hits between them and created a body of work that continues to influence artists today. The exhibit will also focus on the Bakersfield music businesses that evolved in the 1960s, including publishing houses, recording studios, booking and management agencies, radio stations and performance venues, and particularly on Buck Owens Enterprises, the music empire owned and operated by the savvy Owens. It will also explore the enduring impact of the Bakersfield Sound on subsequent generations of musicians, singers and songwriters, from country-rock pioneers the Flying Burrito Brothers to Dwight Yoakam and Brad Paisley, and many others. Among other narrative elements, visitors will learn about the importance of Capitol Records producer Ken Nelson, who recorded numerous Bakersfield classics, including many of Owens’ and Haggard’s hits, and who has been elected to the Country Music Hall of Fame; and the role of the Buckaroos and the Strangers in developing the Bakersfield Sound, with emphasis on key sidemen such as steel guitar innovator Ralph Mooney, Telecaster ace Roy Nichols and lead guitarist and harmony vocalist Don Rich. The Bakersfield-based Mosrite company, who manufactured instruments and issued recordings, also will be highlighted. · Stage costumes worn by the Maddox Brothers & Rose, featuring floral motifs, elaborate embroidery and fringe, created by famed Hollywood designer Nathan Turk; Wynn Stewart’s understated Nudie suit with decorative straps and buckles; several Turk-designed suits worn by Buck Owens; a Nudie suit with motifs from the San Joaquin Valley, worn by Bobby Adamson of the Farmer Boys; and more. · A plethora of important instruments, including Telecasters belonging to Buck Owens and Don Rich; Speedy West’s Bigsby 1948 steel guitar (its whereabouts a mystery for decades); Ralph Mooney’s Fender double-neck pedal steel guitar; and Merle Travis’s electric guitar – one of the first solid-body electric guitars, designed by Travis and built by Paul Bigsby. · Legal documents including the marriage license of Buck and Bonnie Owens; and the “Full Pardon for Crimes of Merle Haggard,” signed March 1, 1972, by then-California Governor Ronald Reagan. Weaving the expansive story together via video screens throughout the gallery is Yoakam, who created a one-of-a-kind oral history – with special guests Merle Haggard and Chris Hillman – especially for this exhibit; the interview was taped at Hollywood’s Capitol Records Tower, where many Bakersfield Sound hits were made. Throughout its 21-month run, The Bakersfield Sound: Buck Owens, Merle Haggard, and California Country will be accompanied by related public programs including live performances, films, panel discussions and more. The schedule will be regularly updated at www.countrymusichalloffame.org. With the purchase of a museum membership ($40/individual membership and $100/friends and family membership), visitors can attend most public programs free of charge for one year, including programming related to Bakersfield Sound. 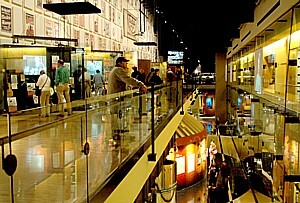 More information about the Country Music Hall of Fame® and Museum is available at www.countrymusichalloffame.org or by calling (615) 416-2001.